Until I read “A Friend in Need” coauthored by two of my favorite YA time travel fantasy authors, Lex Lynam and Chess Desalls, I had never read nor even encountered Tim Hemlin. 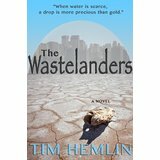 That book inspired me to read Tim Hemlin’s Wastelanders because his characters were interesting. Wastelanders is a dystopian novel with a bit of the mystical tossed in. A post apocalyptic world in which major cities are contained in a force field bubble and the driving force behind the government is the water cartel. The area outside the bubble beyond the rim is considered a wasteland and few people live there. Those who do consist of scavengers, peace loving religious groups, gun runners, prostitution rings and the dredges of society. The plot is very well developed with a battle for control of the nation between the Water Cartel and patriots. There is some level of suspense as the force behind a major destructive event within the bubble is not clearly revealed and is the purported reason for the government strike against those living in the wasteland. I really liked the characters. The protagonist was a peace loving priest and warrior of necessity. The antagonists, as there were more than one in this three sided war, were easy to hate. I like how the author developed the characters by their belief in reincarnation and the internalized revelation of the historical characters the antagonists believed themselves to be. I wouldn’t call Wastelanders a time travel tale, but, there are characters who are able to bend time to their advantage and that was a talent I found quite unique in the world of fantasy. Others, among both the good and bad, had some level of prescience. These talents definitely made the story interesting with the foreboding foreknowledge that often was related in a very inspecific manner. The type of prophesy that is hidden in vague words until the event happens to make it clear. An Excellent read; I really enjoyed this tale, it is appropriate for all ages of readers. This entry was posted in Book Reviews and tagged #IndieBooksBeSeen., Book review, dystopian, indie authors, reviewing books, supporting and Promoting self publishing Indie Authors, The Wastelanders, Tim Hemlin, Time travel novels, YA Fantasy. Bookmark the permalink. Sounds like a blending of Water Babies, Water World and Mad Max, with some magic thrown in. I don’t know about Water Babies, in this one water is scarce and in the bubbles they have desalination plants. The rest the environment is much like Mad Max, yes.